The Global Volcanism Program has no activity reports for Serdán-Oriental. The Global Volcanism Program has no Weekly Reports available for Serdán-Oriental. The Global Volcanism Program has no Bulletin Reports available for Serdán-Oriental. The Serdán-Oriental is a broad closed basin at the eastern end of the Mexican Altiplano dotted with rhyolitic lava domes, tuff cones, tuff rings, lava flows, and scoria cones of late-Pleistocene to Holocene age. 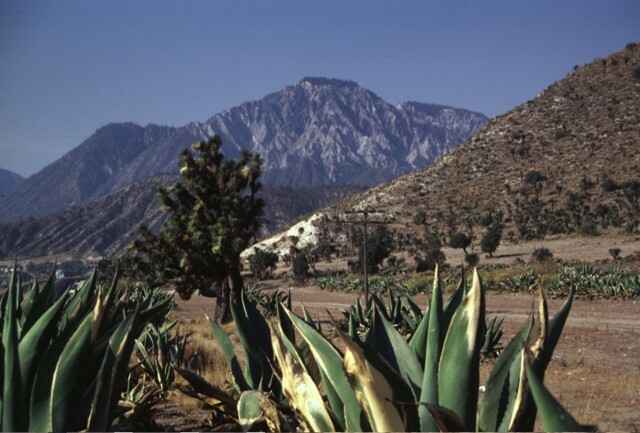 The basin, filled by extensive large lakes during the Pleistocene, is bounded by the Cofre de Perote-Orizaba range on the east and Los Humeros caldera to the north. The most prominent features of the Serdán-Oriental volcanic field are the twin Las Derrumbadas lava domes, surrounded by an apron of debris-avalanche deposits, and the sharp-peaked Cerro Pizarro lava dome at the northern end of the basin. 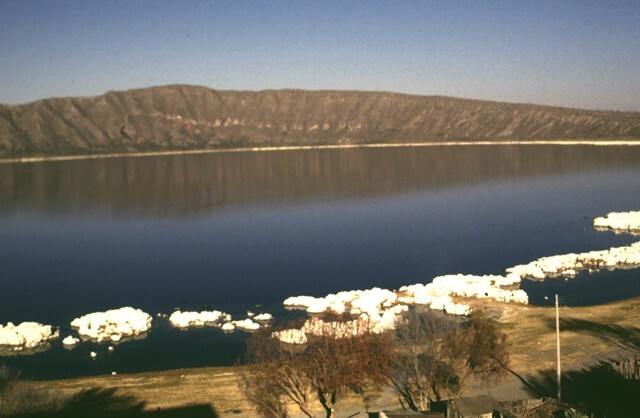 Several of the tuff rings, such as Laguna Atexcac and Laguna Alchichica, are filled with scenic lakes. A major explosive eruption from a vent inferred to be buried within the basin produced the Quetzalapa plinian pumice-fall deposit roughly 20,000 years ago. Carrasco-Nunez G, Ort M H, Romero C, 2007. Evolution and hydrological conditions of a maar volcano (Atexcac crater, Eastern Mexico). J. Volcanol. Geotherm. Res., 159: 179-197. Carrasco-Nunez G, Riggs N R, 2008. Polygenetic nature of a rhyolitic dome and implications for hazard assessment: Cerro Pizarro volcano, Mexico. J. Volcanol. Geotherm. Res., 171: 307-315. Ort M H, Carrasco-Nunez G, 2009. Lateral vent migration during phreatomagmatic and magmatic eruptions at Tecuitlapa maar, east-central Mexico. J. Volcanol. Geotherm. Res., 181: 67-77. Riggs N R, Carrasco-Nunez G, 2004. Evolution of a complex isolated dome system, Cerro Pizarro, central Mexico. Bull Volcanol, 66: 322-335. Siebe C, Verma S P, 1988. Major element geochemistry and tectonic setting of Las Derrumbadas rhyolitic domes, Puebla, Mexico. Chem Erde, 48: 177-189. The Global Volcanism Program is not aware of any Holocene eruptions from Serdán-Oriental. If this volcano has had large eruptions (VEI >= 4) prior to 10,000 years ago, information might be found on the Serdán-Oriental page in the LaMEVE (Large Magnitude Explosive Volcanic Eruptions) database, a part of the Volcano Global Risk Identification and Analysis Project (VOGRIPA). There is no Deformation History data available for Serdán-Oriental. There is no Emissions History data available for Serdán-Oriental. The NW-most dome of the twin Las Derrumbadas lava domes, seen here from the NE along the highway to Perote, displays evidence of extensive hydrothermal alteration. Las Derrumbadas domes remain fumarolically active. 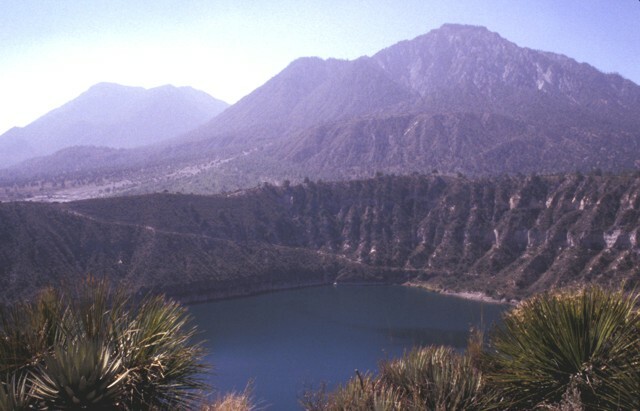 The extensively gullied hillside at the left-center is the outer flank of the San Luis Atexcac tuff ring, whose crater contains a scenic lake. The most prominent features of the Serdán-Oriental volcanic field are the twin Las Derrumbadas lava domes. 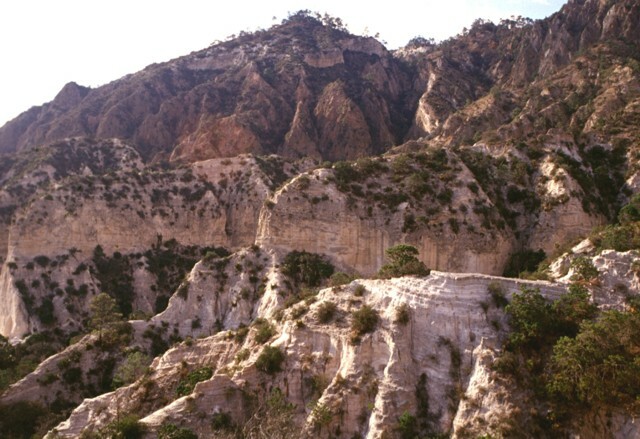 The NW (left) and SE (right) domes are of similar height and rhyolitic lithology and rise about 1000 m above their bases. The Serdán-Oriental is a broad closed basin at the eastern end of the Mexican altiplano dotted with rhyolitic lava domes, tuff cones, tuff rings, lava flows, and scoria cones of late-Pleistocene to Holocene age. Several of the tuff rings, such as Laguna Atexcac and Laguna Alchichica, are filled with scenic lakes. The NW-most of the twin Las Derrumbadas lava domes is surrounded by hummocky debris-avalanche deposits such as those in the foreground that were produced by repeated collapse of the domes. The hummocks contain broad mixtures of rocks, including pyroclastic-surge deposits, Cretaceous limestones, lacustrine sediments, and banded obsidians. These are thought to have originated from a former tuff ring that surrounded the lava domes, but was removed by the slope failures. 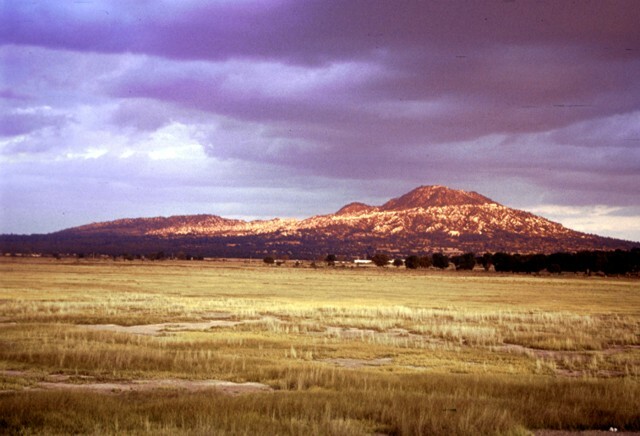 Twin-peaked Cerro Pinto on the NE horizon is a rhyolitic lava dome that rises above the rim of a tuff cone, inside which the dome was emplaced. Cerro Pinto is one of several large lava domes within the enclosed Serdán-Oriental basin. The hills in the foreground are hummocks of a debris-avalanche deposit produced by collapse of Las Derrumbadas lava domes. Cerro Pinto lava dome rises to the NW as viewed from the rim of Laguna San Luis Atexcac maar, just south of Highway 140. The 3100-m-high rhyolitic dome was constructed within a tuff cone with a crater about 2 km wide. The crater overlaps with that of the Cerro Xalapaxco tuff cone to the north. A roadcut through the eastern rim of the Cerro Xalapaxco tuff cone exposes spectacular pyroclastic-surge deposits. The rhyolitic tuff cone displays examples of "dry" surge deposits. 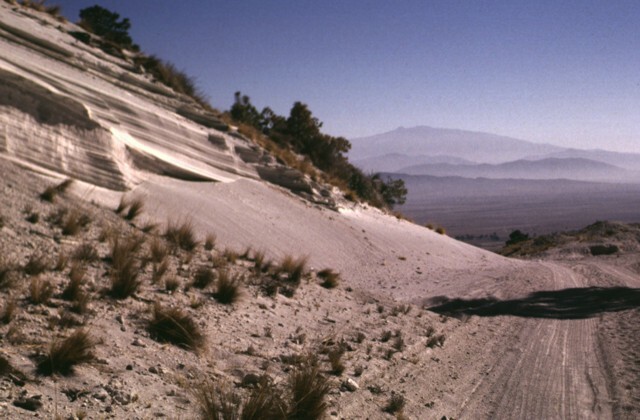 The road provides access to a quarry where perlite (hydrated obsidian) is mined. Cofre de Perote volcano rises on the distant horizon across the Serdán-Oriental basin. Scenic Laguna Alchichicha maar is filled by a broad lake that is the largest of the Serdán-Oriental basin. The rim of the basaltic to basaltic-andesitic maar varies in height and is highest on the western side. The western crater wall exposes a dissected scoria cone that was partially destroyed by the maar-forming eruption. 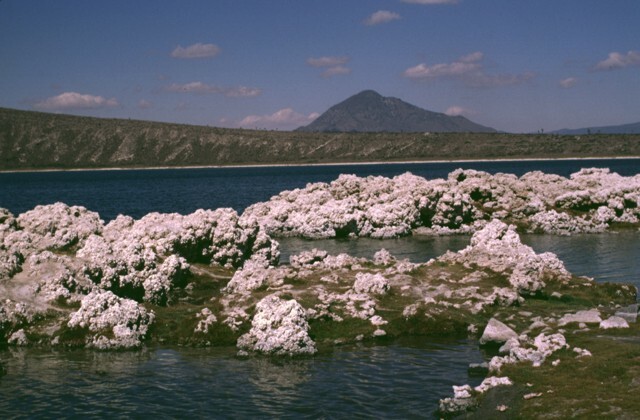 Brilliant-white tufa deposits line the shore of the lake. The twin Las Derrumbadas lava domes tower above the rim of the San Luis Atexcac maar. The two rhyolitic lava domes rise about 1000 m above their bases. 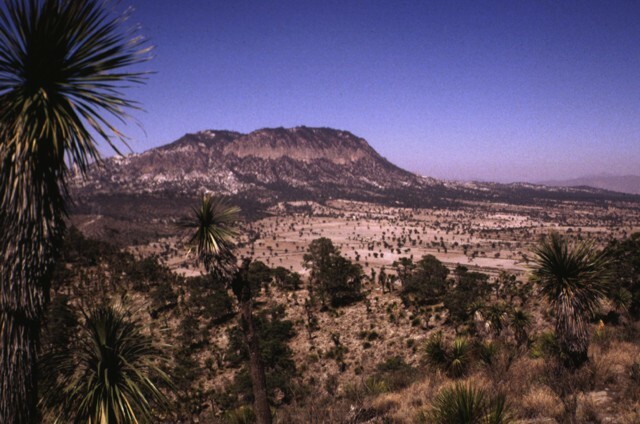 The NW dome (right) consists of a microcrystalline rhyolite that has been extensively altered by fumarolic activity. The SE dome (left) is of similar lithology. The carapace of both domes has been removed by a series of slope failures. 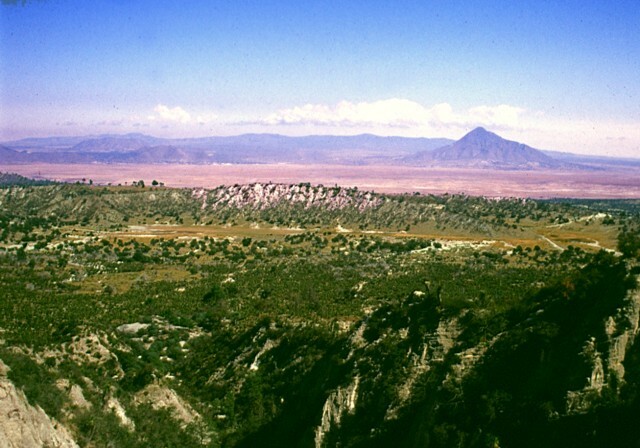 The San Luis Atexcac maar in the foreground was erupted through Cretaceous limestones and Tertiary monzonites and hornsfels. 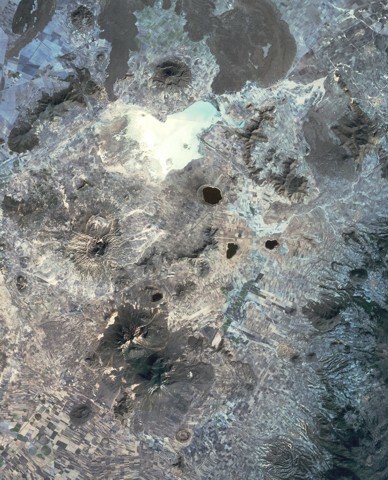 The Laguna Alchichicha maar is the largest of the Serdán-Oriental volcanic field. 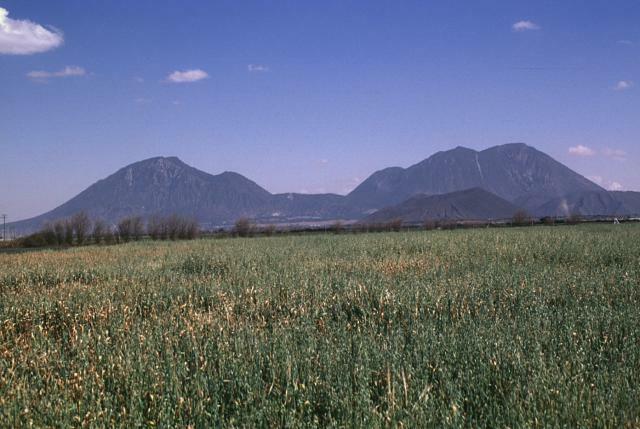 The easily accessible lake-filled maar lies just off highway 140 between Puebla and Jalapa. The low rim of the maar increases in height to the west. The pyroclastic-surge deposits contain juvenile fragments of scoriaceous basaltic or basaltic-andesite material. Spectacular tufa deposits such as those in the foreground are located along the shore of the lake. Cerro Pizarro in the distance is the northermost lava dome of the Serdán-Oriental field. 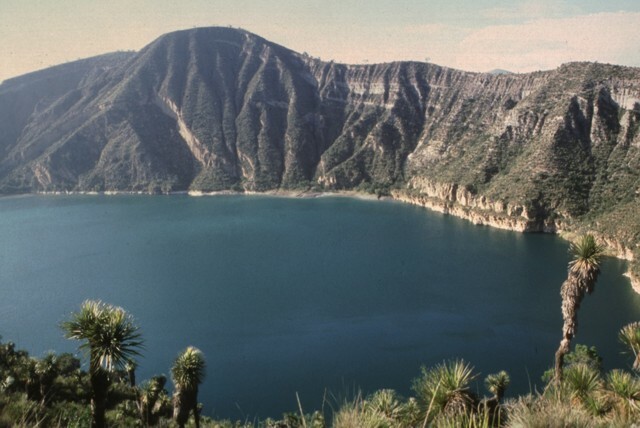 The spectacular San Luis Atexcac maar is one of several lake-filled maars of the Serdán-Oriental volcanic field. The walls of the tuff ring expose pyroclastic-surge beds produced during formation of the maar. Cretaceous limestone beds and remnants of a basaltic scoria cone partially destroyed during formation of the maar are exposed in the western crater walls. Rhyolitic obsidian forms abundant juvenile clasts in the surge deposits. Photo by Hugo Delgado-Granados, 1997 (Universidad Nacional Autónoma de México). The SE-most of the twin Las Derrumbadas lava domes is seen here from the SE. The extensively altered dome is surrounded by debris-avalanche deposits. The more recent avalanche deposits consist almost entirely of microcrystalline rhyolite from the core of the dome. They originated from fresh horseshoe-shaped scars such as the one visible at the upper right. These scarps reveal areas of intense alteration to kaolinite produced by prolonged fumarolic activity. Photo by Hugo Delgado-Granados, 1995 (Universidad Nacional Autónoma de México). 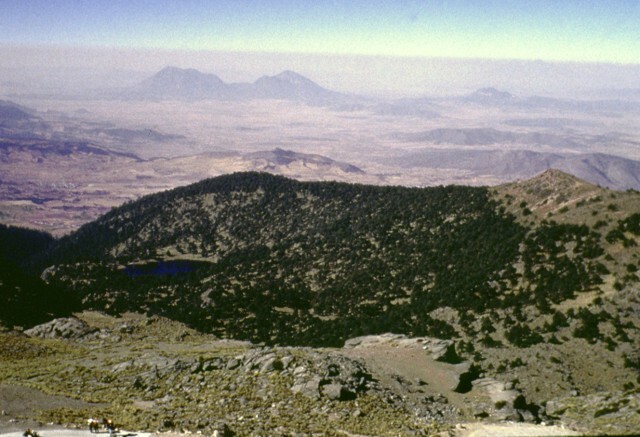 Cerro Pinto lava dome (right) rises 700 m above the floor of the western part of the Serdán-Oriental basin to a height of 3100 m. The flat ridge to its left is the western rim of Cerro Xalapaxco tuff cone. 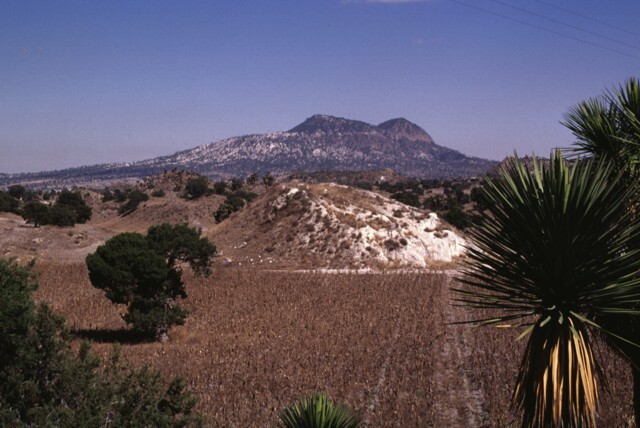 The rhyolitic Cerro Pinto lava dome was constructed within a tuff cone about the same size as 2-3 km wide Cerro Xalapaxco. Rhyolitic pyroclastic-surge deposits in the foreground are exposed in front of Cerro Pinto lava dome. The dome was constructed within a tuff cone whose rim overlaps with that of the adjacent Cerro Xalapaxco tuff cone to the north. The 3100-m-high lava dome has a glassy and pumiceous carapace partly overlain by pyroclastic-surge deposits and blocks of local bedrock. This view of the Serdán-Oriental basin covers about 38 km in a N-S (vertical) direction. 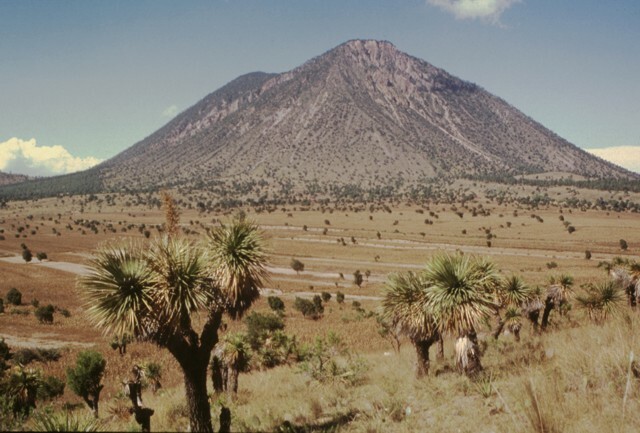 The circular peak at the upper center, partially surrounded by young lava flows from Los Humeros caldera, is Cerro Pizarro lava dome. The lake-filled maar to the SSE across the light-colored dry lake basin is Alchichica maar. 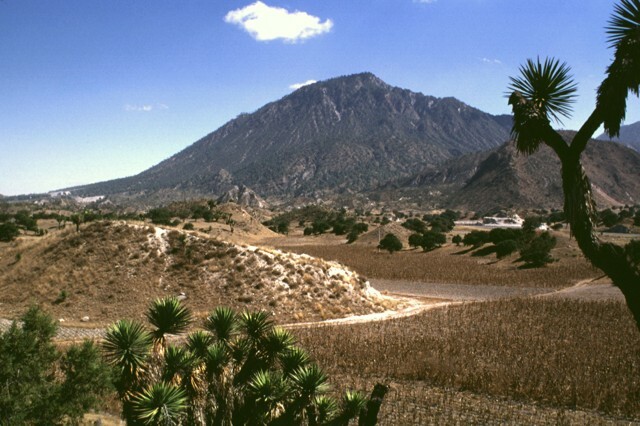 The erosionally ribbed flanks of Cerro Xalapaxco tuff cone and Cerro Pinto lava dome lie to the SW, and the large forested peaks at the bottom are the the twin Las Derrumbadas lava domes. IRIS seismic stations/networks Incorporated Research Institutions for Seismology (IRIS) Data Services map showing the location of seismic stations from all available networks (permanent or temporary) within a radius of 0.18° (about 20 km at mid-latitudes) from the given location of Serdán-Oriental. Users can customize a variety of filters and options in the left panel. Note that if there are no stations are known the map will default to show the entire world with a "No data matched request" error notice. Large Eruptions of Serdán-Oriental Information about large Quaternary eruptions (VEI >= 4) is cataloged in the Large Magnitude Explosive Volcanic Eruptions (LaMEVE) database of the Volcano Global Risk Identification and Analysis Project (VOGRIPA).